WEC Mexico 2014 Presentation: Modeling residential water, energy, GHG emissions and costs in California. This is the presentation that I gave at Water, Energy and Climate Conference organized by the International Water Association, on May 23rd, 2014, in Mexico City. Tags: California, Conference, energy, IWA, Mexico, Nexus, Presentation, Water | Permalink. *This is the last post related with the potential effects of the current California’s drought. In this one I will claim about the necessity of multidisciplinary research proposing promising research topics, and I will develop some conclusions from the research including some global considerations. Take a look at the previous posts (First, Second). Beyond quantification of interactions, new approaches taking advantage of the synergies of these interrelated systems and thus avoiding the implications of isolated management strategies should be implemented to improve global efficiency. There are many promising fields where scientists from different disciplines are crossing the edges, searching for integrative approaches that take the system as a whole into account. The relationship between urban water, energy and GHG emissions (Escriva-Bou et al., ongoing research); agricultural responses to shocks in water and energy prices and/or availability (Medellin-Azuara et al., 2011); reconciliation ecology (Rosenzweig, 2003); GHG emission reduction from agricultural practices (Smith et al., 2007) or environmental policies related with water, energy and food production are some of the encouraging fields where more multidisciplinary research is needed. California’s intertied water network has improved the robustness of statewide water demands and its economic profits to protect against potential short-term shocks such as the current drought and even long-term trends such as climate change which may bring uncertain effects. As has been shown, one of the main features characterizing the system is that most of the demands have diversified their water source portfolio in order to increase their economic reliability, even creating institutional tools including water markets. But when water fails, normality is altered, hydropower generation diminishes, the agricultural sector uses more energy to pump or convey water, raising GHG emissions at the same time, and food production input costs increases. Only through urban demand-side policies can water be saved without direct costs —just a temporal loss in the living-standards utility function— and achieving a significant water-related energy and GHG emissions savings. All those interrelations have non-trivial economic implications: from the perspective of the ordinary citizen, urban water rates would increase if DSMP are implemented, and food and energy prices would have some price effect due to reduced hydropower production and increased input costs for the food production sector; water and energy utilities will incur some extra costs because of the drought, but they will be relatively small due to improved water and energy source portfolios; from the agricultural sector, and assuming that prices will vary slightly because of the international trade, the increased input costs will cause significant economic losses and a reduction in the labor market, especially in those counties that are largely dependent on the agricultural sector; and finally accounting for statewide general consequences, GHG emissions will increase from reduced hydropower production and increased urban and agricultural pumping and conveyance, whereas the expected decrease will depend on the effectiveness of the urban conservation policies taken. Less developed countries with a greater share of the gross product determined by the agricultural sector should expect larger impacts of economic and labor market losses from water scarcity. Countries highly dependent on hydropower could suffer significant problems of energy supply due to water shortages, and a severe drought could imply a significant effect on final energy prices. Therefore, improvements of the energy portfolio should be a priority for countries with uncertain climate projections. Agricultural regions not shaped by the international trade are expected to suffer high price volatility for food commodities. Less integrated water systems or those dependent on a unique water source will be more vulnerable to droughts. Therefore, integrated approaches are essential to assess the interrelated effects of water, food production, energy and environment systems in more vulnerable regions to minimize economic losses and potential damages. This study has been developed as a result of a mobility stay funded by the Erasmus Mundus Programme of the European Commission under the Transatlantic Partnership for Excellence in Engineering – TEE Project. I would like to thank my advisors Dr. Jay R. Lund (University of California, Davis) and Dr. Manuel Pulido-Velazquez (Universitat Politècnica de València), as well as Dr. Josue Medellin-Azuara as well, for their thought-provoking comments. Finally, I want to thank specially my friend Dr. Stephen Pearce, who reviewed the final version and contributed with helpful suggestions. Rosenzweig ML (2003) Reconciliation ecology and the future of species diversity. Oryx 37:194-205. Smith P, Martino D, Cai ZC, Gwary D, Janzen H, Kumar P, McCarl B, Ogle S, O’Mara F, Rice C, Scholes B, Sirotenko O, Howden M, McAllister T, Pan GX, Romanenkov V, Schneider U, Towprayoon S (2007) Policy and technological constraints to implementation of greenhouse gas mitigation options in agriculture. Agr Ecosyst Environ 118:6-28. Tags: agriculture, California, Drought, economics, energy, environment, multidisciplinary, water management | Permalink. California is currently suffering one of the driest years on record and as a persistently water-stressed region all the alarms have been activated. 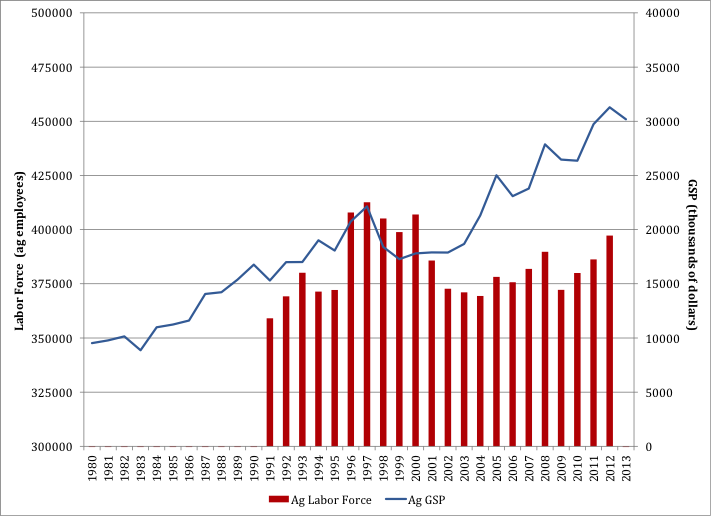 If the drought persists, there may be serious economic consequences for California’s agriculture, which may suffer from a rise in unemployment. 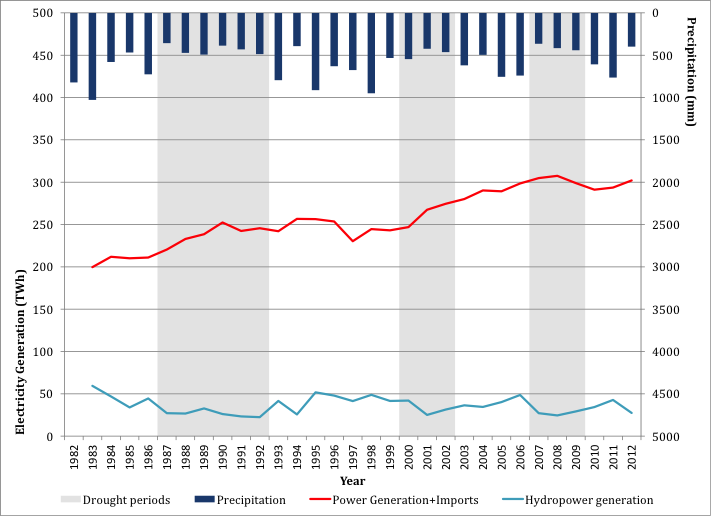 Water scarcity will likely decrease hydroelectric power generation affecting electricity prices and indirectly lead to an increase in greenhouse gas emissions from substitutive sources. More broadly, the drought will affect the living standards of most Californian residents, as urban water conservation strategies are implemented through water price increases or even rationing of this valuable resource. The wide consequences of this severe drought have led to increased attention from both scientists and policy-makers, as it is becoming increasingly clear that water, food, energy and climate systems are highly interdependent. The water cycle is energy intensive and most energy sources require some water inputs. Food production relies on irrigated croplands, which consumes large amounts of energy and water. The energy consumption of the water cycle and food production combined results in the daily release of many tons of greenhouse gases into the atmosphere. The economic consequences of these connections are huge and sometimes very complex to understand, making their assessment a challenging task. Traditionally, professionals of each of these disciplines have worked in isolation, often making many assumptions regarding data from other fields. Fortunately the scientific community has come to realize the potential implications of shared approaches, and recent studies have begun to assess the important relationships between water and energy, food and water, and energy and climate change. While simple assessments of an individual aspect of this problem are essential as a foundation, more integrative approaches considering all aspects of this problem will be required to determine the most economically efficient policies for tackling water stress in the future. In this essay I want to identify the economic threats that food, energy and environment systems have to deal with by comparing findings from previous drought events, showing the necessity of multidisciplinary research. We first summarize the main features of California’s water, energy and food production systems, accounting for their economic implications and their consequences on the environment. After that I present some promising interdisciplinary research topics and finally, based on local conclusions, we develop some considerations of water scarcity on a global context. California has a Mediterranean climate with rainy winters, dry summers and huge temporal and spatial variability in water availability and demand. Among other consequences, this has resulted in significant investment in the hydraulic infrastructure that exists in the state today. Normally 75 percent of California’s average precipitation occurs between November and March (DWR, 2012). Although70 percent of runoff occurs north of the Sacramento-San Joaquin Delta, 75 percent of the state’s demand lies to the south (Hanak et al., 2011), especially for irrigation of the high-value croplands, with peak usage falling within the dry season. In an average year, California uses roughly 80 million acre-foot of water to irrigate crops, supply potable water to cities and maintain ecosystems. According to the California Water Plan (DWR, 2009) 49 percent (39 MAF) of total freshwater is used for environmental purposes, 41 percent (33 MAF) is consumed by the agricultural sector and only 10 percent (8 MAF) is diverted to urban areas. Another feature of California’s climate is the multi-year hydrological cycles that cause alternation between wet periods and persistent droughts (Figure 1). Even though there is only limited evidence for an increased trend globally in drought or dryness since the middle of the 20th century (Hartmann et al., 2013), changes in population and economic development over the next 25 years will dictate the future relationship between water supply and demand to a much greater degree than will changes in climate (Vorosmarty et al., 2000). These two factors —multi-year uncertainty in resources and increasing demands— represent the greatest challenges currently facing water management researches and decision-makers in California. 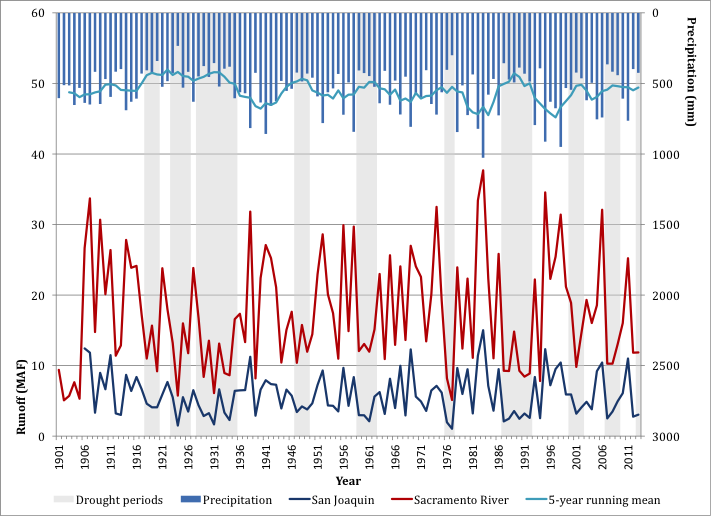 Figure 1: California historic statewide precipitation, main rivers’ runoff and drought periods. Considering all of this information, the rainy season is almost ended and 2014 has been a very dry year so far. Considering that 2013 was also dry, current water management strategy is garnering much attention and many minds are focused in developing the best-response actions under an uncertain future. As is shown in Figure 2, for the first time since the beginning of this century, a significant percentage of the state is classified within the Exceptional Drought category according to U.S. Drought Monitor, and the whole state is below normal levels of humidity. Figure 2: California statewide percentage area in U.S. Drought Monitor Categories. Data source: Fuchs (2014). Despite these pressing problems, California is well placed to overcome them. The extensive, integrated and flexible water system that was built mostly during the 20th century has the ability to transfer water between almost any two locations across the state, regardless of distance. As is shown in Figure 3, local, state and federal projects have connected the relatively wet and unpopulated north with the agricultural regions in the Central Valley and the populous cities of southern California, using the delta of the Sacramento and San Joaquin rivers as a water hub. By learning from historical dry events and taking advantage of an intertied water network, California’s water users have diversified its water source portfolio in order to improve its reliability. Most agricultural water users can switch from surface to groundwater sources when the former is scarce, but what is more impressive is the variety of water sources available to some urban water utilities—especially those traditionally more vulnerable to drought. One such case is that of San Diego County Water Utility that sources water from its reservoirs, pumping from aquifers, reusing recycled water, importing water from northern California or from the Colorado River, and in the future through a desalination plant. Another strength of California’s system which is a result of its integrated network combined with the different economic profitability of water uses and a proper regulation of water institutions, is the water market that has been extraordinarily helpful during periods of drought. As is shown in Figure 4 water transfers have grown substantially since the early 1980s with different phases in its development (Hanak and Stryjewski, 2012). First, in the late 1980s, short-term purchases triggered the water market to alleviate the effects of the 1987-1992 drought. Later, by the end of the 1990s water markets were driven by environmental concerns. Finally, in most of the 2000s we can observe how long-term agreements have taken the place of short-term transfers as a long-run strategy, while at the same time, a significant part of the water committed in these long-term agreements has not been transferred. As water transfers demonstrate, water has an economical value as a private commodity and, as far as it is possible through water infrastructure connections, urban utilities and high-value farms are able to buy water from low-value producers. 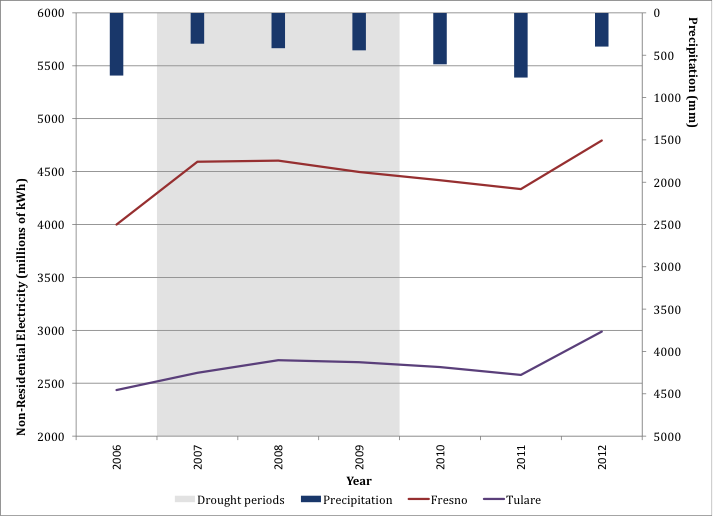 Figure 4: Water transfers in California depending on their nature. Data source: Hanak and Stryjewski (2012). Therefore, what can we expect from drought? Because agricultural yields depend on applied water, and only certain types of annual crops will survive reduced irrigation, most farmers will maintain this practice to sustain their profits, unless offered incentives, such as revenues from water transfers, to switch crops. If there are cutoffs in surface water, farmers will switch to groundwater sources if they are able meaning that most surface water shortages will be replaced by groundwater. This will result in increased production costs for farmers, and in overexploited aquifers, the current situation will worsen, with the potential risk that further falls in the water table level will mean some wells are no longer usable. For urban water use, demand-side management policies (DSMP) have become an essential strategy when short-term events such as droughts drastically reduce water reliability and it is hard or expensive to find temporary new water supplies. Therefore, we can expect that policies such as increases in urban water rates, non-economic strategies such as public campaigns, or even water rationing if the situation deteriorates, will be applied more commonly. In the last few years, a significant proportion of transfers bought in the water market have been committed but not transferred, thus I foresee that both urban and high-value agricultural producers, especially growers of perennial crops with a risk of high losses, will transfer these commitments. If the drought persists, I expect an increase in the number of short-terms agreements. This will result in increased water prices for both urban and agricultural sectors. DWR (2009) California Water Plan. Update 2009. Available at http://www.waterplan.water.ca.gov/cwpu2009/. Accessed 20/4/2014. DWR (2012) Drought in California. California Department of Water Resources. Natural Resources Agency. State of California . Fall 2012. Fuchs B (2014) United States drought monitor. National Drought Mitigation Center. Available at http://droughtmonitor.unl.edu/Home/Narrative.aspx. Accessed 21/4/2014. Hanak E, Lund J, Dinar A, Gray B, Howitt R, Mount JF, Moyle PB, Thompson B (2011) Managing California’s Water: From Conflict to Reconciliation. Public Policy Institue of California, San Franciso, CA. Hanak E, Stryjewski E (2012) California´s water market, by the numbers: Update 2012. Public Policy Institute of California. Vorosmarty CJ, Green P, Salisbury J, Lammers RB (2000) Global water resources: Vulnerability from climate change and population growth. Science 289:284-288. *This is the first of three posts related with the potential effects of the current California’s drought on food production, energy and the environment, and the necessity of multidisciplinary researches to improve current knowledge. Tags: California, Drought, economics, energy, water management | Permalink.